You don't get many of these in a pound of mince. I've already got my New Year's resolution in the bag: it's to keep away from auctions. Not the online variety but the real, traditional kind. Thankfully, there aren't that many around where I live so temptation is kept to manageable proportions - usually. I succumbed a little on Saturday although it could have been worse. I check out a local auction when they have camera-related stuff up for sale, roughly every two months. I'm no longer a net spender on photographic equipment. If I can't make a deal pay for itself I let it pass. At auctions there's always the chance that I can pick up some gear, keep a couple of bits for myself and sell the rest on Ebay to cover my initial outlay. I've done that successfully a couple of times. That way I can continue to enjoy some new bits and pieces without any further expenditure. Last weekend's auction didn't have as much camera equipment as it has had in the past but I had a look anyway. What I really fancied was a lot that comprised two lovely Pentax Spotmatics, 28mm f3.5 and 135mm f3.5 Super Takumar lenses and a pair of beautiful 50mm f1.4 Super Taks, the kind with the radioactive Thorium glass which develops a lovely yellowish tint over time (saves using a yellow filter?). Do I need any of this? Absolutely not but when has that ever mattered? I tallied up the likely Ebay value, figured out what I could bid so that I could keep one of the fifties and the 28mm for myself and break even after I'd shifted everything on Ebay. I wasn't able to get along to the Saturday auction and missed it by £3. Bugger! That wasn't the only lot I left a bid on, though. 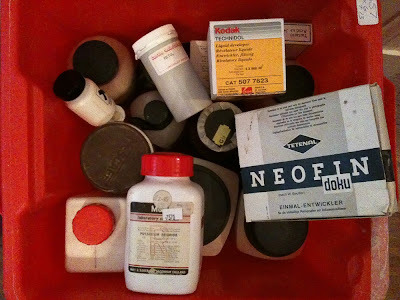 I also made an offer on one lot of several boxes of darkroom stuff which included four Smiths timers, five developing tanks, a few really old safelights, two contact sheet printing frames, a guillotine and three boxes of chemicals almost all in powered form. I wanted a timer and thought the chemicals would be useful but I wasn't too bothered about this lot. As luck would have it, my bid was the highest. I wish it had gone the other way and I'd won the Pentax outfit but there you go. Curious, I had a quick look on the NSA's favourite information gathering tool, Google, but there's nothing at all that I could see about this lamp. What to do with it? Are these things collectible? If so, by whom? And is it worth anything? 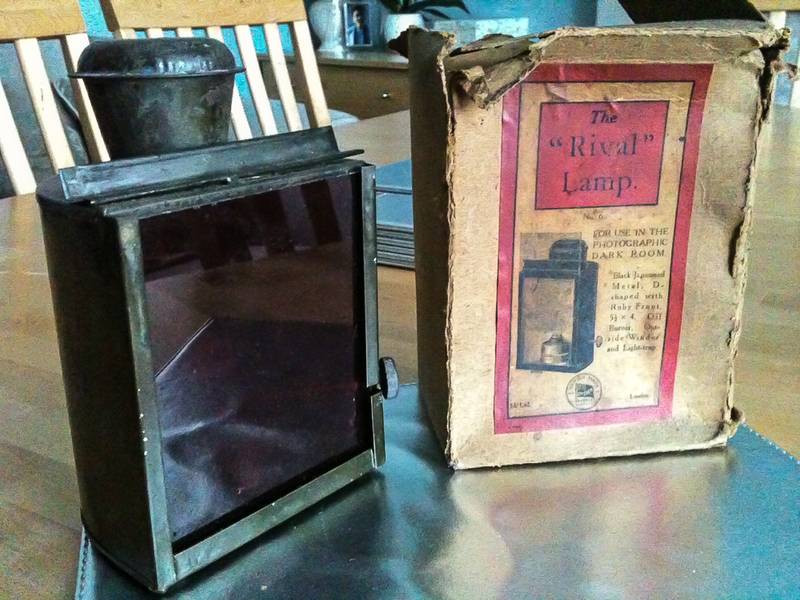 The other lamps looked of a similar vintage but were smaller. 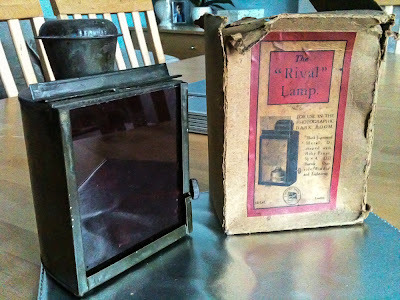 There was also one old, electric-powered lamp that has interchangeable glass filters and there were about half a dozen filters in the lot as well. All very interesting. This lot would probably wipe out a small town if poured into its water supply. The chemicals, too, turned out to be worth having providing, as I believe, powdered chemicals last a long time. There's about £50 worth of Metol, £15 worth of Phenidone, £25 worth of Hydroquinone, £25 worth of Pyrogallol and quantities of sodium sulphite, potassium bromide, potassium ferricyanide, and lots more. There was even some 20-odd year old commercial packs of developer such s ID11, Hyfin and three unopened vials of Technidol. Is Technidol useful for anything other than no-longer made Technical Pan? There are some powders that I'll have to look up in my big 1950s book of obscure chemicals to see what they do. Potassium nitrate? Genochrome? Platinum Chloride? Potassium Dichromate? The chemicals could have come from the now defunct Rayco which was the major UK supplier of photographic raw chemicals for many years, according to some literature I found in the boxes. The picture above of some chemicals is about a quarter of what I've got. I'm not sure what I'll do with it all but it will certainly keep me in Barry Thornton's two-bath developer for about a hundred years. Included in the lot was Processing and Formulae, a Kodak Data Book. It lists formulae for the likes of D76, D72, D25 and D23. It might be interesting mixing up some older, more obscure developers from this booklet and some others I have in my library just for the fun of it. Might as well use up the chemicals somehow. Hi Bruce great find the chemicals. I am interested in the potassium dichromate if you want to sell on .Its used in gum bichromate and gum oil printing(I have yet to try this process) and silver print still supply but by law only to professional bodies like schools and collages . This may increase its value to the amateur . Hi Bruce, you might find this useful www.platinummetalsreview.com/pdf/pmr-v28-i4-178-188.pdf‎. Here's a link for the hazards/toxicity of platinum salts just in case you decide to use it http://hazmap.nlm.nih.gov/category-details?id=51&table=copytblagents. If you're thinking of selling on the platinum chloride instead, let me know! Hi Bruce - that's a great wee grab-bag of chems! Rayco chemicals were really good - I still ahve some 9 or 10 year old Metol from them which works fine . . as with all things - lack of oxidation is the key. Well done that man . . and Pyrogallol . . have you seen the price of it? I'll get back to you re the chemicals once I've sorted through everything. Thanks Bruce, no problem! If your interested in making up your own developers etc. I'd highly recommend the Darkroom Cookbook by Steve Anchell published by Focal Press. I have the second edition, it's still available on Amazon and is now in it's third edition and on Kindle. I haven't got that book, Kenny, but I've got quite a few old ones from the 1930s-1950s that have some good recipes in them. It would be interesting using the chemicals to mix up some obscure developers to see what they're like but with the price of film nowadays that's a luxury I can't afford.